Throw the penguin as high as possible in this bloody version of the original game. Use your mouse to control the game. Good Luck in this funny game! Yetis know nothing about animal rights. And even they knew something about it I don’t think they should mind it. 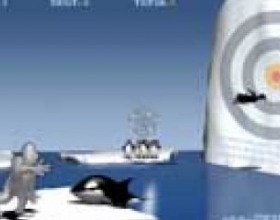 In this bloody orca slap game you have to throw ice at jumping penguins in order to down them to a wall. Your aim is to get Pingu past all the giraffes, elephants and snakes to make the greatest distance. Control the game by clicking your left mouse button. First click defines angle and second click defines power of your swing. Slap the penguin into the target. Left mouse button: throw snowball. Mouse-cursor position: define direction. Hit position affects vertical throw direction. Pingu rotation (at hit) affects left/right direction. 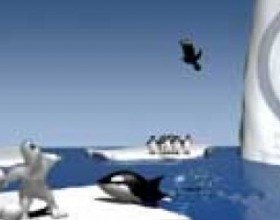 Perhaps everybody knows a series of games that gained a great popularity thanks to a tremendous polar monster that throws other animals, penguins being his victims most often. In some games it thus helps penguins to get to Antarctica, when they lost their way and found themselves on the Australia shore. 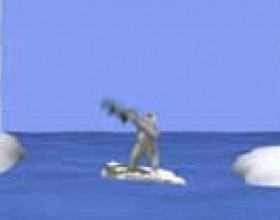 He tosses the penguin up using the board and there is an option that they are grabbed by some albatross flying by. Here there is a need to help the bird in order to make a penguin fly as far as possible. 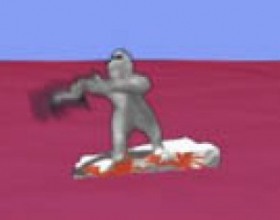 In some games this huge yeti throws penguins up, so they strike against the high ice wall, thus flying higher and higher. Here, too, it all depends upon how well and smoothly you push this penguin. Another very amusing game is the one in which yeti is throwing snowballs at penguins. After an especially successful throw the penguin can stick to the wall. Little children experience immense admiration from such a game. Yeti especially dislikes penguins and can do with them literally everything. In one of the games the penguins are launched using hefty batons. They jump on it from a little rock and yeti beats them with his baton looking at how far they fly. Almost all games a total number of points earned depends on how precisely and accurately a blow has been made or how far the penguin has flown in a given direction. So yetisports is some kind of a skill-based game since it requires a certain level of dexterity and precision. Generally, everything depends upon how quickly you respond to the location of all components of the game. Actually, you will not succeed if you'll just randomly click on the mouse button trying to make at least some points. This game should be approached with logic and cold calculation. Yetisports series games during a rather short time gained a great deal of popularity on mobile devices. When the first phones with a wide screen and flash applications began to conquer the market, these games were almost standard there. Over time, their popularity little faded a little but they haven’t completely disappeared and are still actively played by children nowadays. Everyone wants to score as many points as possible and boast excellent results to the friends. This section of our website is constantly updated and new interesting games are added in which the main characters are penguins and a sturdy Bigfoot. If you get bored and do not know what to do, visit our web resource and spend some time with really cool guys who will definitely quickly raise your spirits!